Roofing Guidelines web pages contain important information about roofing materials and accessories and their installation. Roofing Code Information web pages alert Roofing Contractors and Building Inspectors to important information and issues that have to do with the roofing industry. General Roofing Information web pages have to do with general roofing information that will improve communications between all those interested in roofing. The guidelines here are to help both the Roofing Consumer and Roofing Contractor have a good quality roof installation that passes the roof inspection and to greatly reduce the chance of roof leaks, or other roofing problems, callbacks and litigations. The following web pages provide information about Roofing Code related subjects. The purpose is to share the information with Building Departments and Roofing Contractors as we are made aware of it or as we discover it. The web pages report on potential problems related to roofing materials, accessories, and installations in addition to Building Codes and Manufacturer's Specifications and Installation Manuals. This web page lists some examples of conflicts between the International Building Code (IBC), the International Residential Code (IRC), the International Code Council (ICC) Current and Legacy Evaluation Services Reports and Manufacturer's Specifications and Installation Manuals. This web page discusses the problem of many roofing installations where non-ASTM Numbered Underlayments have been used. After further investigation, we found this problem is very widespread over the entire region and has been for years. This web page contains drawings/sketches of the various areas of a roof that are labeled with the common terns used in the roofing industry to help communications between the Roofing Contractor, Building Inspector, Property Owner, and anyone else who has an interest in the roofing industry. This web page describes the Types of Roofing which is not to be confused with types of roofing materials. Types of Roofing defines what types of roofing materials can be used and where. There are basically two main types of roofing defined by the pitch or slope of the roof: Steep-Sloped Roofing and Low Sloped or Flat Roofing. 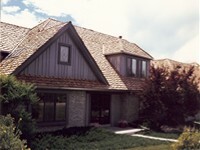 Roofing materials are designed for one or the other.